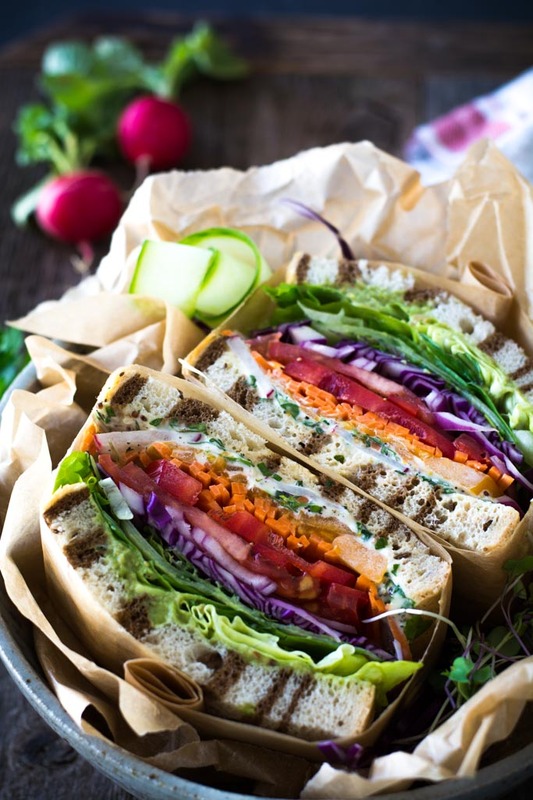 I’m eating the rainbow again with the amazing California veggie sandwich with fresh herb mayo layered between marbled rye. 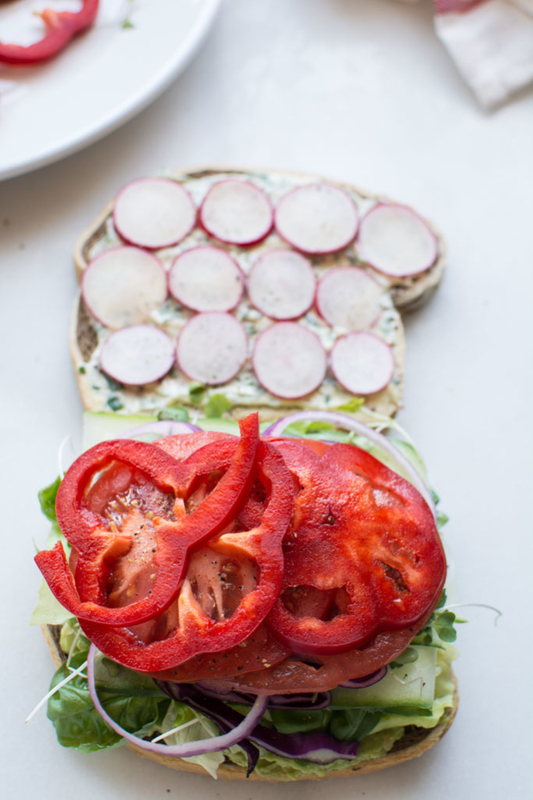 This sandwich is bright and refreshing. 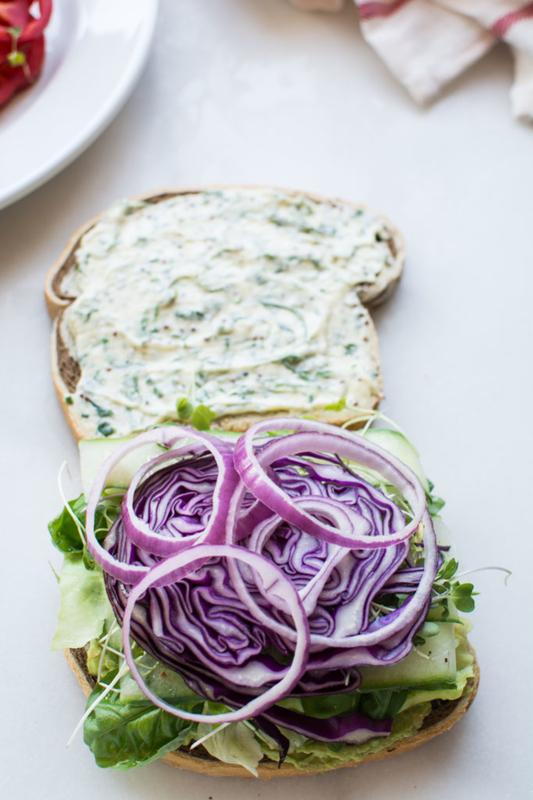 Fresh herbs and grainy Dijon in the mayo make this my new favorite summer sandwich. 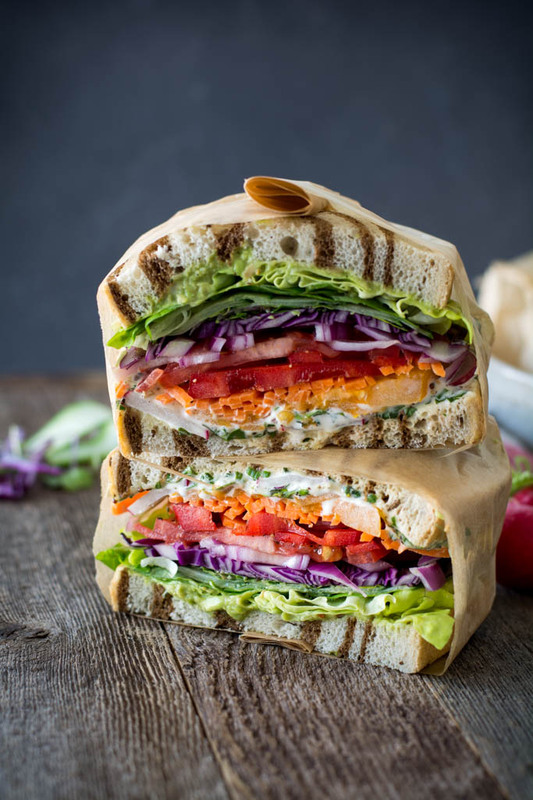 The fresh herbs bring one more layer of flavor into the California veggie sandwich with fresh herb mayo. I rarely find a good loaf of marbled rye in my part of town and it’s one of my favorites. 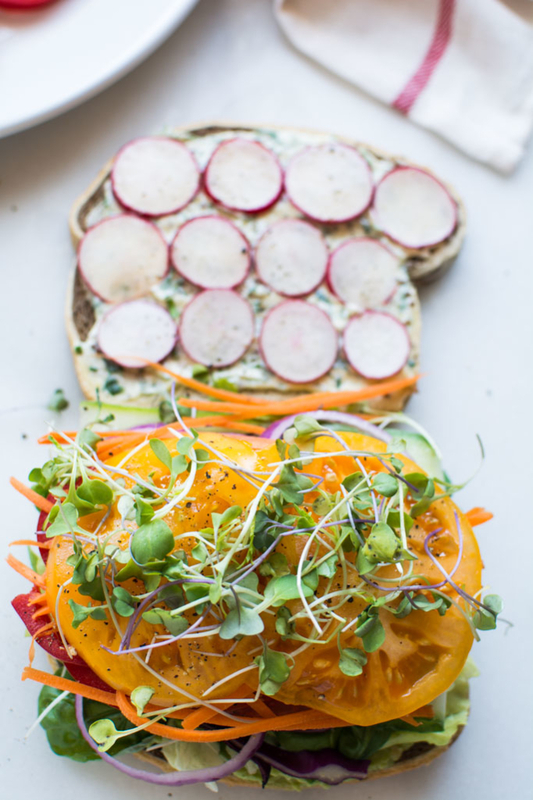 When I found the bread, I knew right away that It needed to be stuffed with colorful veggies. A good sturdy multi-grain bread would be fabulous as well. I have finally planted my garden. Once I was off my knee scooter and walking in a boot, I was able to get to work. I can hardly wait to start picking my own fresh vegetables. It’s the best time of year. Gather the freshest veggies you can find. I’m using and assortment of heirloom tomatoes, leafy lettuce, sweet peppers, carrots, ribbons of cucumber, purple cabbage, radishes, red onions, micro greens, and what ever herbs I can clip from my garden. Begin my making the herbed mayo and avocado spread. 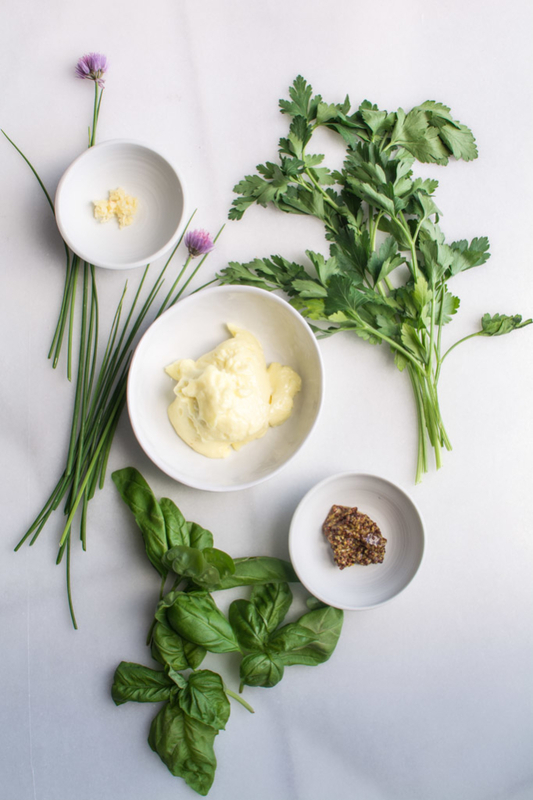 In a small bowl, combine mayo, garlic, grainy Dijon, and fresh herbs. I am using chives, parsley, and basil. Add a dash of salt and pepper. 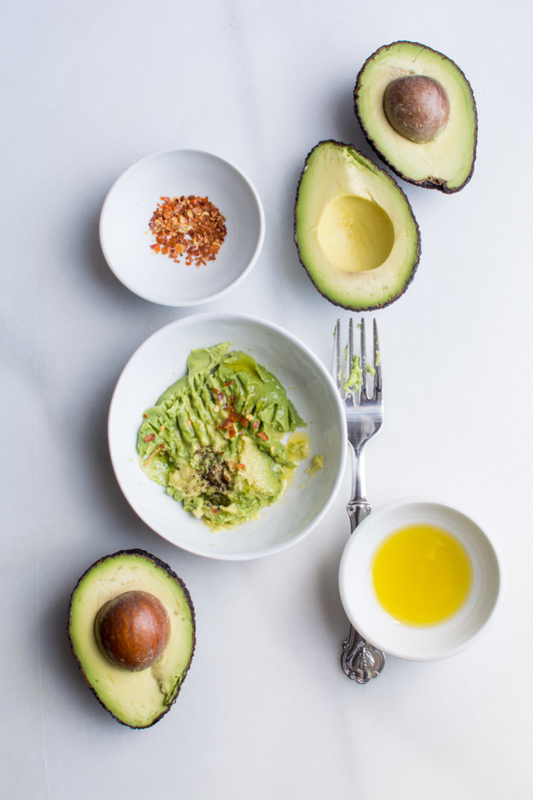 To make the avocado spread, use one ripe avocado, a drizzle of olive oil, a large pinch of red pepper flakes, salt, and pepper. Mix ingredients my smashing avocado with a fork and mixing in the seasonings. Place two slices of your favorite bread. 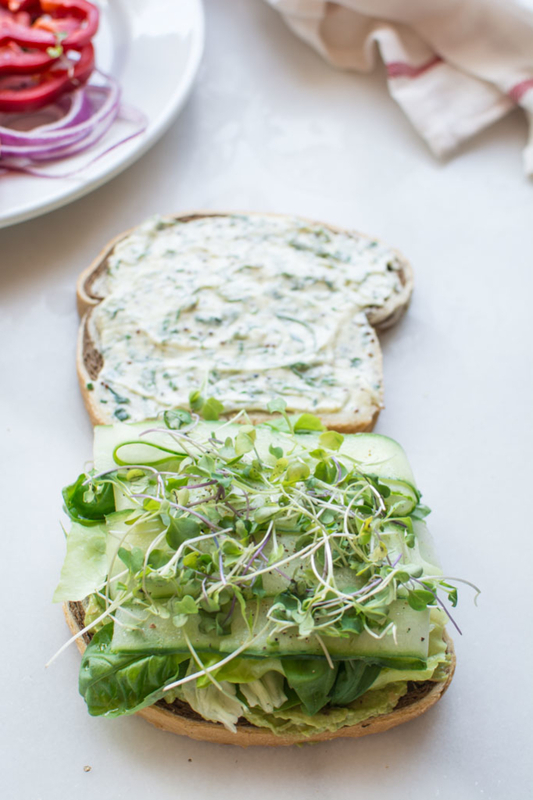 Spread one slice with the herbed mayo and the other slice with the avocado spread. Begin to layer. I like to start with my greens then work my way through the rainbow. I like to season the veggies with a fresh grind of pepper. 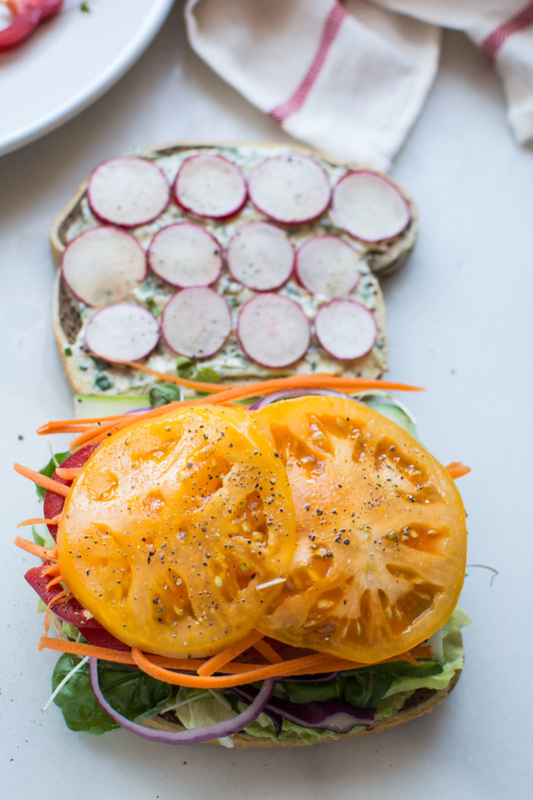 I avoid salting because salt will cause the cucumbers and radishes to sweat and they will release water which will make the sandwich go soggy. Yikes! I like to add a good layer or two of fresh micro greens or sprouts. Pea sprouts are one of my favorites. How easy was that? Layer as thick or thin as your mouth can get around. 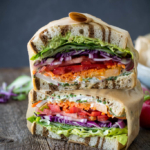 Enjoy the flavors of the season with a fresh California veggie sandwich with fresh herb mayo. If you like to add protein, go ahead and add a slice of organic smoked turkey, or grilled Tofu. If you’re vegan, be sure to use Vegenaise in place of regular mayo. 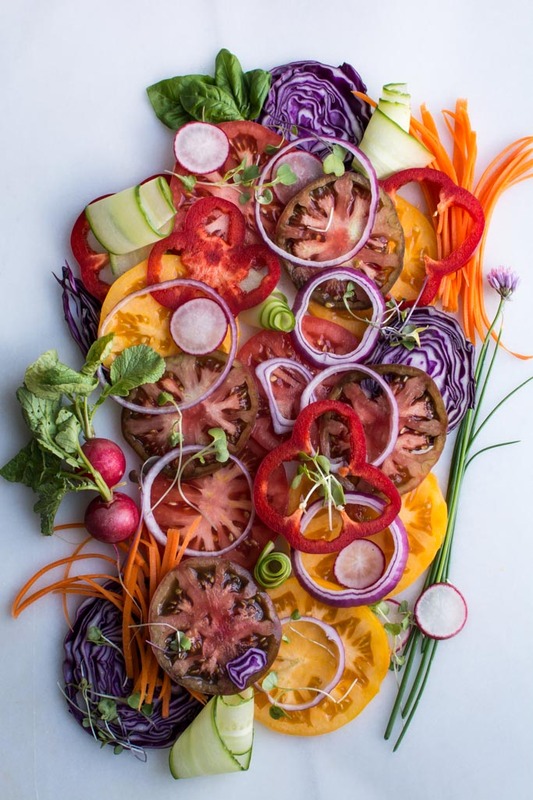 Colorful veggies layered with fresh herb mayo. 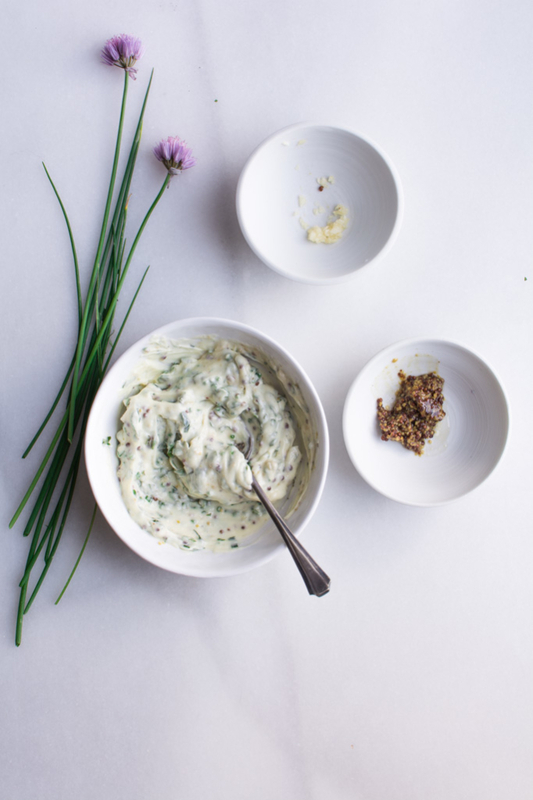 In a small bowl, mix mayo with grainy dijon, and garlic. Add salt and pepper to taste. In a small bowl, smash avocado with a fork and mix in oil, red pepper flakes, salt and pepper to taste. Take two slices of bread. Spread one slice with mayo and one slice of with avocado spread. Begin to layer veggies. 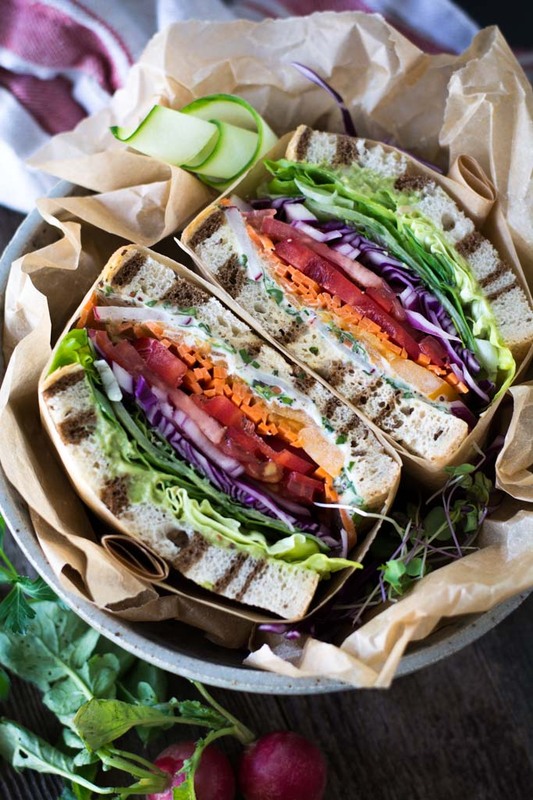 Be sure to use a good sturdy bread that can hold the weight of the veggies. Whole grain, sour dough, etc. 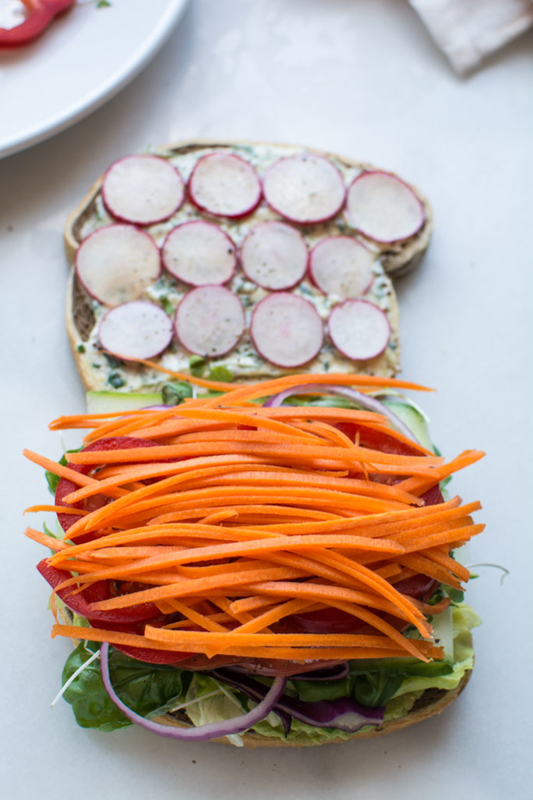 Don't sprinkle veggies with salt, it will make they release water and make the sandwich soggy. 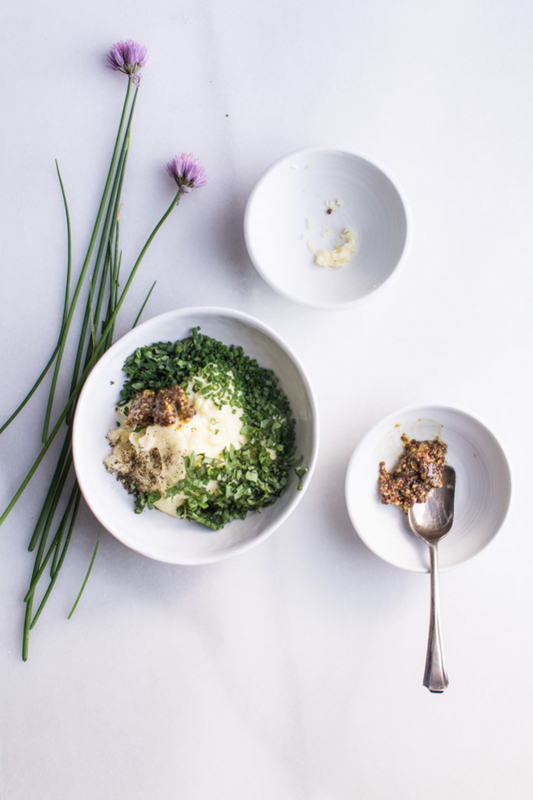 Calorie calculations vary with amounts of veggies, bread used, and amount of spreads.